When you deal with a fictional universe, you can go the route of producing actual kits from that universe, or take off on your own and produce hypothetical vehicles that could reside in that universe. Mr. X Models has gone that route - produced two Land Speeders based on "what-ifs". The first kit is labeled as a Speeder Mk.III and has the most parts of the two. 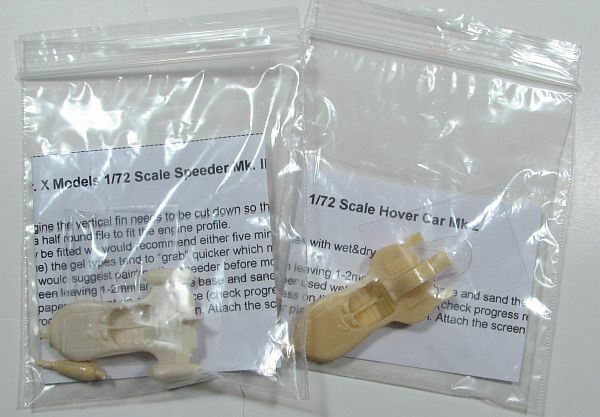 In the package you receive the speeder itself, along with the third engine (the one on top of the structure) separate, as well as a vacumformed windscreen. Follow the instructions to mount the third engine and now you can paint. After painting you cut the windscreen out and sand it to fit. Now you have an extra science fiction "speeder". The second kit is labeled as a Hover Car Mk. 2 and this one only has two pieces - the car itself and a vacumformed windscreen. Clean up the car, paint it, then cut and sand the windscreen out and you have another, different "Land Speeder" to sit on your shelf next to your other Star Wars models. If you're wondering about how to make these look "realistic" in a diorama or display, one thing that comes to mind is right out of the Star Wars movie "A New Hope" (now labeled as Star Wars IV). There is one scene with the Sand People tossing things out of Luke's Speeder and there are rocks "strategically placed" to hide (in the original release from the '70s) the gear the "real" speeder was on. You can do this with one of these. Place the speeder next to a "rock", and between that rock and one of the Mr. X Speeders is some sort of rod, that can be easily hid. Or, you could also look into magnets of some sort, strong enough to hold the speeder above the base. Like anything in any science fiction universe, you are limited only by your imagination. You can build these Mr. X Speeders as stand-alone models, or ones to be placed in a large diorama. In any eventy, they're very nicely cast and should be easy to build. I want to thank Mr. X Models for sending this in to review. Note that you can purchase Mr. X science fiction models from RetrokiT.